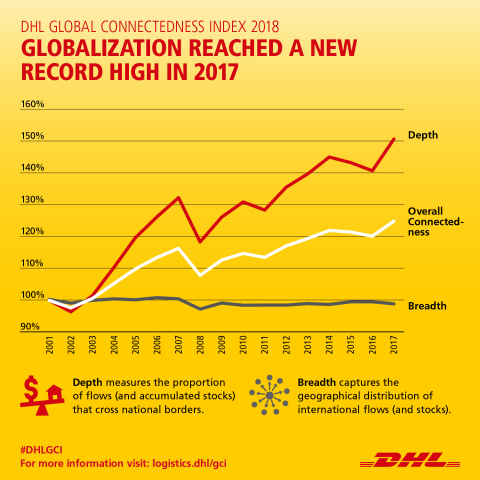 DHL released today the fifth edition of the DHL Global Connectedness Index (GCI) – a detailed analysis of globalization, measured by international flows of trade, capital, information and people. The new GCI report represents the first comprehensive assessment of developments in globalization across 169 countries and territories since the Brexit referendum in the United Kingdom and the 2016 presidential election in the United States. In spite of growing anti-globalization tensions in many countries, connectedness reached an all-time high in 2017, as the flows of trade, capital, information and people across national borders all intensified significantly for the first time since 2007. Strong economic growth boosted international flows while key policy changes such as US tariff increases had not yet been implemented. The 2018 index measures the current state of globalization, as well as individual rankings for each country, based on the depth (intensity of international flows) and breadth (geographical distribution of flows) of countries’ international connections. The world’s top five most globally connected countries in 2017 were the Netherlands, Singapore, Switzerland, Belgium and the United Arab Emirates. Eight of the top 10 most connected countries are located in Europe, helping make it the world’s most connected region, in particular for trade and people flows. North America, the leader in capital and information flows, ranked second among world regions, followed by the Middle East and North Africa in third place. The GCI continues to reveal vast differences between levels of globalization in advanced versus emerging economies. Emerging economies trade almost as intensively as advanced economies, but advanced economies are more than three times as deeply integrated into international capital flows, five times for people flows, and almost nine times with respect to information flows. Additionally, while leaders from large emerging markets have become major supporters of globalization on the world stage, emerging economies’ progress catching up in terms of global connectedness has stalled. The five countries where international flows exceed expectations the most are Cambodia, Malaysia, Mozambique, Singapore, and Viet Nam. Four of these top five countries are located in Southeast Asia. Southeast Asian countries benefit from linkages with wider Asian supply chain networks as well as ASEAN policy initiatives promoting economic integration. This is positive news for the region, because deeper global connectedness can help accelerate countries’ economic growth. The report was commissioned by DHL and authored by Steven A. Altman, Pankaj Ghemawat, and Phillip Bastian of the New York University Stern School of Business and the IESE Business School. The 2018 DHL Global Connectedness Index draws on more than 3 million data points from international flows covering trade, capital, information and people. It documents and dissects levels of globalization, both at the global level and for 169 countries and territories that jointly account for 99% of the world’s GDP and 97% of its population.